A terminating wave pattern. 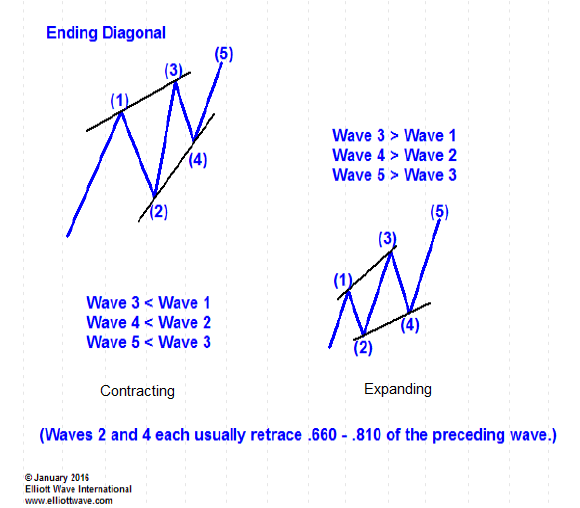 May only form as Wave 5 or as Wave C in a Flat or Zigzag (nothing else). 95% of the time they are the contracting variety and demonstrate zigzags, or double or triple zigzags, but they are always comprised of the 3 wave structure. 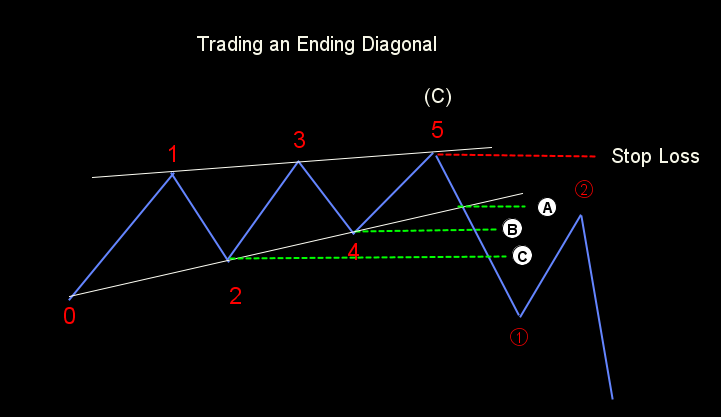 An ending diagonal appears at the termination point of larger movements, most often as wave 5. Rarely as wave C.
Frequently you will see a through-over the trend line in wave 5. You can almost expect to see it. Very normal attempt to shake out weak hands before moving in the opposite direction. The retracements always start with a swift drop, commonly down to the wave 2 low of the diagonal, and ultimately ending about even with the origin of the pattern. Are generally thought to occur when the preceding waves have gone "too far, too fast." Using point A, the break of the trend line has the potential of yielding greater ultimate profit. It also has a better chance of never resulting in a drawdown during the corrective wave 2 that is to follow. 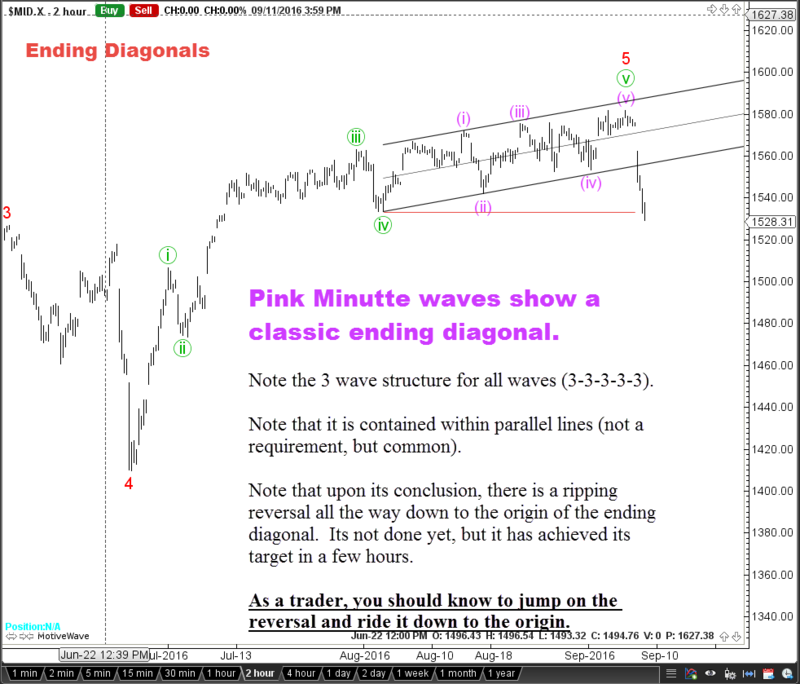 The risk to using point A is that Wave 5 may not be finished. It may cross the trend line only to pull back through it to a new high. Using point B is more conservative. Once the wave 4 pivot is passed, Wave 5 is clearly finished, but by waiting until then you have reduced the ultimate profit on the trade and run the risk of a bigger drawdown, especially if W2 retraces up to near the origin of Wave 1, near the stop loss line. Using point C is even more conservative and has an even bigger reduction in profits and possible drawdown. From the author's perspective, you may be better off taking the unconfirmed trade right after the wave 5 pivot. While wave 5 may not yet be done, your potential loss is very limited because you have a tight stop loss. Other considerations would be to raise your stop loss up to the point where, should wave 5 reach it, wave 3 would be the shortest wave. Contracting diagonals provide the unique opportunity to use this technique.